Whenever a comic book property finds success in another media, the publishers usually make an effort to reshape their books to reflect the more popular adaptation. This is why Spider-Man eventually developed organic web-shooters in the comics and why Spider-Man briefly readopted his black costume around the same time that Spider-Man 3 came out. Presumably that is why this issue of Green Arrow has seen fit to bring John Diggle and Oliver Queen's mother Moira into the New 52 universe. Nominally a tie-in with the Batman: Zero Year storyline, the real focus of this issue is Diggle and his efforts to protect Mrs. Queen from the villainous Killer Moth. Batman does show up to deal with the criminal but it is Moira's son Oliver - newly returned from his time on the island - who truly saves the day. Jeff Lemire wisely does not allow Oliver Queen to be upstaged in his own title - a lesson that escaped far too many Green Arrow writers during past team-up stories. Lemire continues to develop the characters in a back-up tale which reveals an interesting little wrinkle - Diggle was a part of Ollie's original support team when he first began his campaign as The Green Arrow! Fans of the Arrow TV series will be relieved to see that Diggle is largely unchanged in terms of personality, though his motivations for helping Oliver in this reality are slightly different. 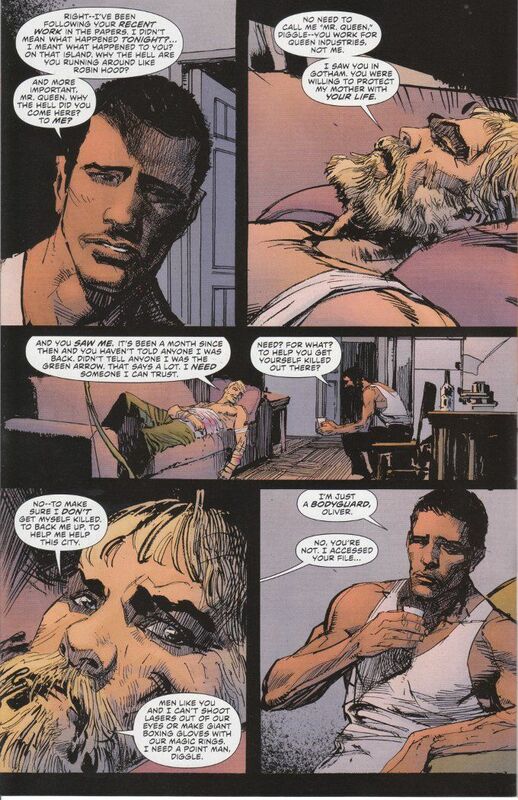 Hopefully this story will continue to be explored in future issues and we will finally get some explanation about the relationship between Oliver Queen and Roy Harper in the New 52 universe. The artwork on this title is as excellent as ever. Andrea Sorrentino continues his usual stellar job on the main portion of the book. The back-up feature - with pencils by Denys Cowen and inks by Bill Sienkiewicz - is somewhat sketchier but no less enjoyable than Sorrentino's style. My one complaint is that Oliver looks far older than he should in this sequence, even allowing for the years added on by the beard. That being said, if you're an Arrow-head who has yet to get into the monthly comics, this issue would be a fine one to start with. The story is a good one, full of action and excitement. The artwork is top-notch. Truly one of the best books on the stands today!